Snapchat just announced some major updates and new features to the app, including the most buzzed about – “Memories” feature. Until today, Snapchat was known and loved for its ephemeral, disappearing content…..well, that ship has sailed. Snapchat’s newest “Memories” feature allows users to save and share old and new Snaps in a private gallery inside the app. Think of it as a living, social camera roll in which photos and videos can be organized, edited, and shared long after they are taken. 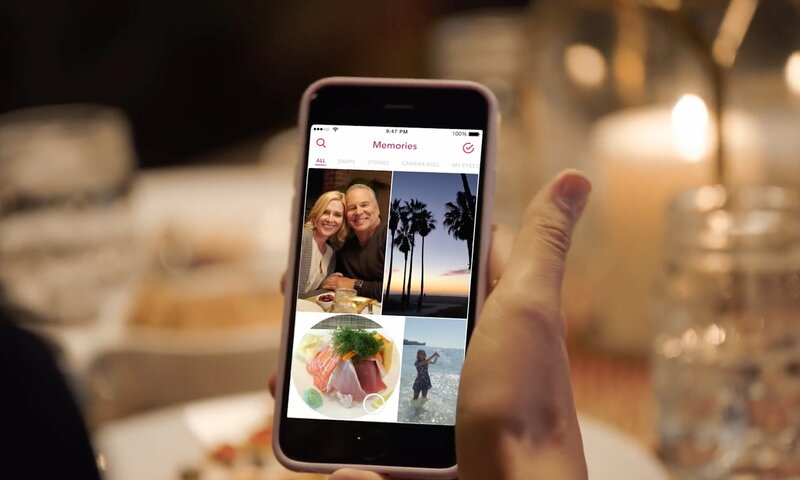 You can even search for a specific Snap or Story – just type keywords like “dog” or “Hawaii” — that way you can spend less time searching and more time enjoying your Memories. You can also use Memories to create new Stories from Snaps you’ve taken, or even combine different Stories into a longer narrative. You could use it to celebrate an anniversary or birthday by finding a few old Snaps and stringing them together into a whole new Story! Why Is This Snapchat Update Important? This means Snapchat can (and most likely, will) see much more highly produced, pre-recorded video content rather than the raw feel that made everyone a power-user. We’re seeing a lot of changes with video content on social media, such as live video on Facebook and Instagram changing the maximum video length to 60 seconds. How Will Snapchat Users Change? Previously, Snapchat users would save the photos and videos they create straight to the native camera roll on their phone, but this might encourage users to save all within Snapchat because they can be accessed, edited, and shared later. No more disappearing. How Do I Access Snapchat “Memories”? Once you receive the update (you’ll get a notification from Team Snapchat when “Memories” is ready for you), you can access the “Memories” feature by swiping up from the camera screen. Once there, your content appears with the most recent at the top. Within the “Memories” section, rectangular posts are individual Snaps, circular posts are stories, which offer previews of the Snaps they contain, and there are also tabs for viewing just Snaps, just stories, or your phone’s complete camera roll. Snapchat is also introducing a feature called “My Eyes Only” in case you have photos and videos that you want to keep private. To access them, you’ll need to enter a code or PIN that you set. If you think about the times when you’ve handed your phone to a friend to swipe through your camera roll, but they accidentally saw an embarrassing photo or video you didn’t want them to see, this solves that problem. It may result in more people using Snapchat as their camera and camera roll rather than the one that comes on your phone. Snapchat is slowly rolling out the “Memories” feature over the next month. You’ll receive a Chat from Team Snapchat when Memories is ready for you to use. Have fun Snapping!